Craving dolphin meatballs? Can’t find a reliable restaurant for boiled parrot? Have a hankering for jellyfish omelettes, sows’ wombs in brine, sheep’s brain pate, or stuffed mice? 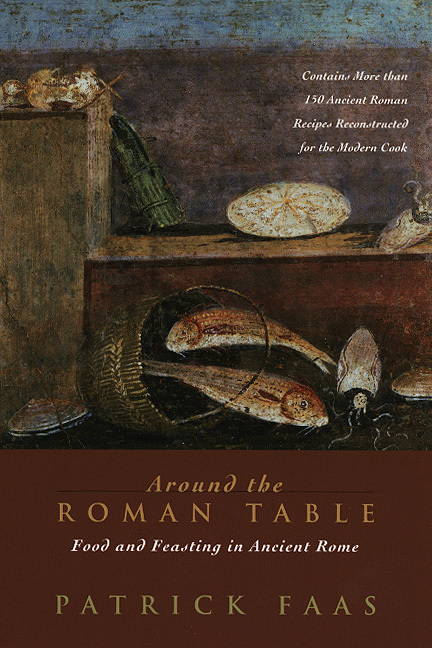 Look no further than Around the Roman Table, a unique hybrid cookbook and history lesson. A portrait of Roman society from the vantage point of the dining table, kitchen, and market stalls, Around the Roman Table offers both an account of Roman eating customs and 150 recipes reconstructed for the modern cook. Faas guides readers through the culinary conquests of Roman invasions—as conquerors pillaged foodstuffs from faraway lands—to the decadence of Imperial Rome and its associated table manners, dining arrangements, spices, seasonings, and cooking techniques. With recipes for such appetizing dishes as chicken galantine with lambs’ brains and fish relish, Around the Roman Table is ideal for food aficionados who wish to understand how the desire for power and conquest was manifested in Roman appetites. "There are many misconceptions about the food of ancient Rome that Faas sets out to correct. The result is half cookbook, half history book and is entirely fascinating to both chef and antiquarian alike. . . . . To read Mr. Faas book is a pleasure, to put it to use requires a certain spirit. Many of the recipes he includes in the book are accessible to the adventurous cook and will definitely reward a curious mind and palate." "The author has chosen a representative cross-section of ancient recipes and has provided adaptations and background material that will render the volume quite used friendly, especially for students who wish to try their hand at ancient cuiosine."